Sophia the Cluminger Spaniel at 4 years old—"Sophia is such a sweet loving calm but playful love bug :) She does not shed as much as the Clumber nor does she drool! She loves to cuddle on the couch and is very calm and well mannered in the house. She loves children and other animals ! Outside she loves to track birds, go for hikes and swim in the lake. She has the best of both traits found in her purebred parents. 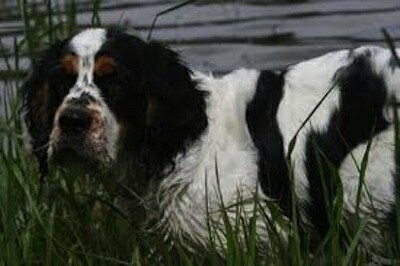 :)"
The Cluminger Spaniel is not a purebred dog. It is a cross between the English Springer Spaniel and the Clumber Spaniel. The best way to determine the temperament of a mixed breed is to look up all breeds in the cross and know you can get any combination of any of the characteristics found in either breed. Not all of these designer hybrid dogs being bred are 50% purebred to 50% purebred. It is very common for breeders to breed multi-generation crosses. Griffin the Cluminger Spaniel puppy at 4 months old—"He gets along with our female Springer, our cat and is very good with people/kids. We have found this to be a great mix! He is very lovable and laid back. However, he is also vocal and loves to chew! He is always making us laugh with his "sad" face and adorable personality!"